Apokoronas is one of the very green regions of Crete and Vamos village lies about 30 kilometers to the east of the old Venetian city of Canea. The scenery is slighty hilly and gives our secluded house its name, Vamos- on the Hills. 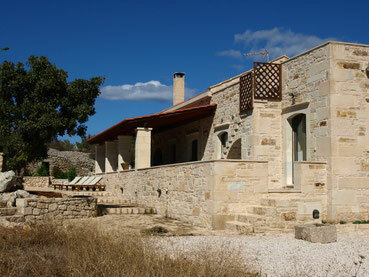 Our stone house was built in 2008 as a traditional Cretan year round single-family home with 170m2 living space. It lies on a 6000 m²-large property with olive groves, lined with small mediterranean oak woods which alternate in color and animated sheep pastures, and the growth and smell of red African grounds. Natural materials like stone, ceramics and mighty cedar trunks were chosen for the construction of the ceiling and roof framework. Every single stone of the house, each scented wooden beam invites you to enjoy the dwelling with pleasure in a traditional life style of Crete. Our stone house can be used all year round, also in winter and during the chilly season. It has double glazed aluminum windows and doors, as well as a central heating with floor and radiator heating in every room.